COLUMBUS, Ohio - No. 1 Columbus Africentric defeated No. 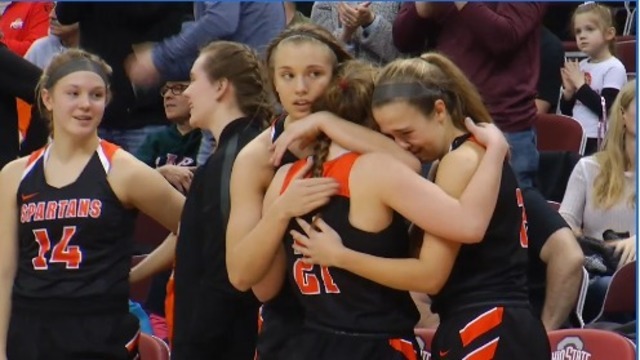 3 Waynesville 51-47 in a battle of the unbeaten to claim the 2019 OHSAA Division III girls basketball state championship Saturday at the Jerome Schottenstein Center. Africentric (28-0) joins Pickerington Central as the only schools to win seven state titles. Pickerington Central has the opportunity to make it eight when they match up against Mount Notre Dame in the Division I championship game at 8:30 p.m.
Africentric has now won back-to-back titles and three in the past four seasons. For a team that scored less than 60 only twice in the 2018-19 season, the Africentric offense got off to an uncharacteristically slow start; leading Waynesville 18-15 at the half. Even as the offense awoke in the second half to the tune of 33 points, it primarily came from offensive rebounding. "It was the worst-shooting performance in the state tournament since I've been here," Africentric head coach William McKinney said after the game. "But, I was never worried about the scoring; it was going to come eventually, and it was great to fight and grind one out with great defense and rebounding." Waynesville (27-1) outshot the Nubians 37% to 27%, but the Nubians outrebounded the Spartans 46-24 including 26 on the offensive end leading to easy put-backs. Despite playing through the stomach flu and a 102-degree fever that sent her to urgent care the night before the game, Division III Player of the Year, senior Jordan Horston, was the co-leading scorer in the game with 15 points. Horston added 10 rebounds, a game-high six assists and two steals. Horston, a three-time state champion, is now tied for the seventh-most points scored in OHSAA girls basketball state tournament history with 101 in her career. Sophomore Maliyah Johnson led the Nubians in rebounds with 13, including nine offensive, and added seven points. Starting the fourth quarter down 39-24, Waynesville could've rolled over and succumb to the full-court Africentric defensive pressure, but the Spartans refused to quit and opened the quarter with a 12-4 run to cut the Nubian lead to six with 4:16 left. From that point, Waynesville senior Rachel Murray and Horston traded baskets, scoring the game's next 11 points to make it 50-42 in favor Africentric with 24 seconds left, leaving too little time for Waynesville to finish the comeback. Murray, a senior First Team All-Ohio guard, finished with 15 points, and senior Marcella Sizer finished with 13 points and 12 rebounds for the Spartans. This was Waynesville's second trip to the state tournament and first to the championship game. Attendance for the game was 4,042.